Shannon Rosedale, a Catholic Charities Fort Worth (CCFW) staff member, began spending time in the Las Vegas Trail (LVT) neighborhood in Fort Worth in March of this year. 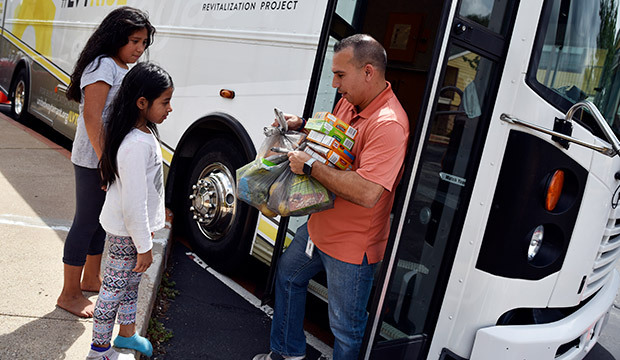 That’s when CCFW staff members started regularly rolling into the area in their brightly-painted, 45-foot bus, parking outside schools and apartment complexes and offering opportunities for residents to come aboard to meet with helping professionals in a welcoming space. The mobile community center serves as a visible sign of hope in the impoverished area, Rosedale said. CCFW staff members are able to assess a client’s needs on the spot, and to offer immediate help with emergency food, housing, and utilities, as well as mental health and crisis counseling services. The bus is outfitted with desks, Wi-Fi-connected computers, and comfortable seating. One recent encounter is typical of the work CCFW and partnering agency staff members are able to do from the mobile unit, Rosedale said. “We invited one young man onto the bus after he told us that he had just become homeless, because a temporary job had just ended,” she explained. Within the span of 35 minutes, CCFW arranged for the man to join a housing program, receive a bus pass, and had provided him with the necessary professional clothing for the area employer interview that Workforce Solutions had simultaneously arranged for him for the next day. CCFW’s comprehensive and collaborative approach to eradicating poverty is, according to Dr. Brian Byrd, Fort Worth City Councilman for District 3, a game changer, as he works with community leaders and LVT residents to address the neighborhood’s overwhelming needs. The mile-long strip on the city’s west side, known for its poverty and crime, stretches from I-30 south to Camp Bowie Boulevard, comprising a small slice of the 76116 zip code. 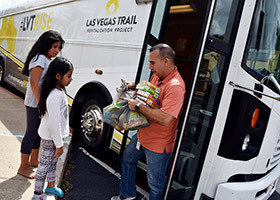 A dynamic community-wide partnership — known as #LVTRISE — of city officials, law enforcement, educators, social service agencies, and private companies has been created, with the goal of transforming the area into a safe and stable neighborhood. According to Byrd, Heather Reynolds, CCFW’s president and CEO, is an “indispensable” leader within the partnership. “Heather is truly brilliant and innovative in her approach to ending poverty,” Byrd said. To learn more, visit CatholicCharitiesFortWorth.org or UnitedWayTarrant.org/lvtrp or call 817-534-0814.